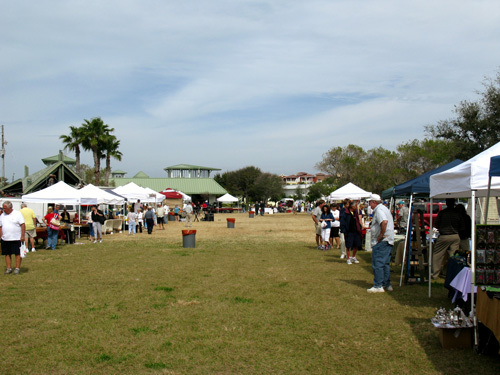 I went to the Treasure Island Open Air Market this morning. 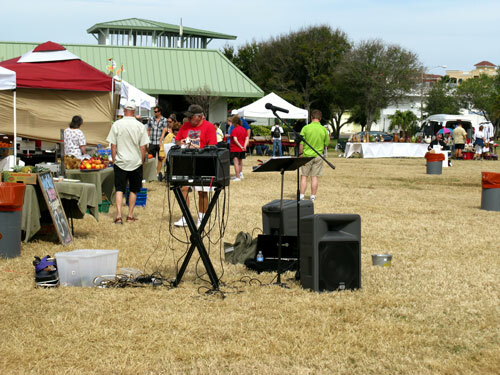 It was a low-key event in Treasure Island, FL and definitely an interesting venue for a cheap Florida beach vacation. I had seen the sign announcing this community event a couple of days before when I was down here taking pictures at the beach and enjoying breakfast at Caddy's. It was held at the Treasure Island Community Center and I was surprised at the number of cars already there when I arrived. Our visitors from Canada, Michigan, and New York have become pretty expert on finding interesting experiences for their cheap Florida vacation. The booths were laid out north-south on the big playground/park area out back. 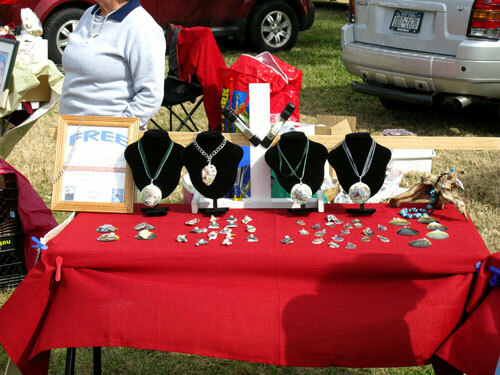 There were tables for jewelery, art, and memorabilia...as well tables for hardware, food, produce, and some things that looked like leftovers from a church bazaar. This little sign tipped me off to the Open Air Market a few days before. 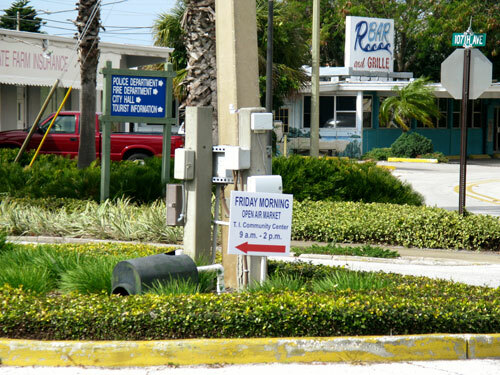 These were placed in several strategic places along 107th Avenue. 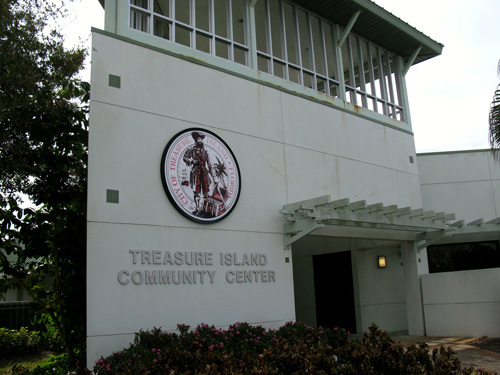 The Treasure Island Community Center is pretty easy to find. At 1 Park Place & 106th Avenue, it is just south of the "downtown" area. 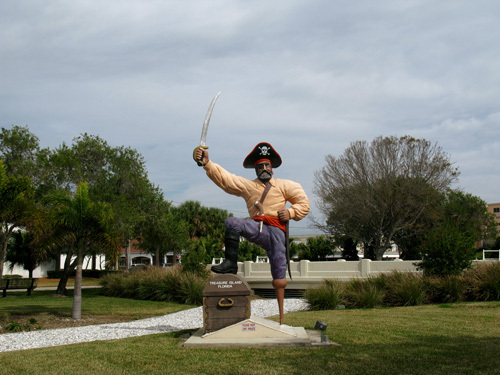 The giant pirate at the north end of the playground is a great landmark. 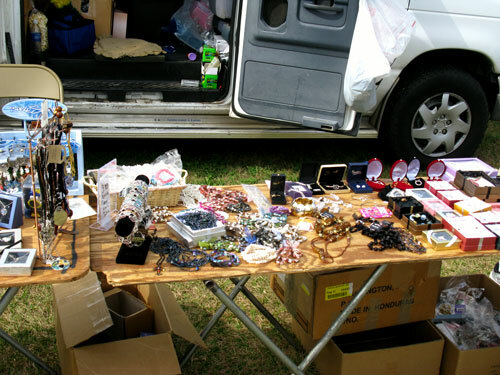 The vendor tables lined both sides of the lawn and people were already examining the curious and interesting articles for sale. A karaoke machine was clearly visible, but no one was participating...yet. A CD of 60's and 70's songs was playing and lots of people seemed to be singing along as they shopped. This bright red table of large jewelery caught my eye first. I don't know how many sales they made, but the way it was laid out certainly was a draw to the shoppers. 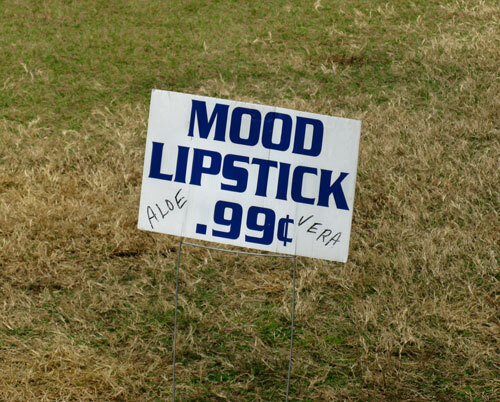 This "Mood Lipstick" sign caught my eye about the same time. My girlfriend wasn't with me, but I know she would have wanted to see what THAT was all about. To me, it was better just left alone. 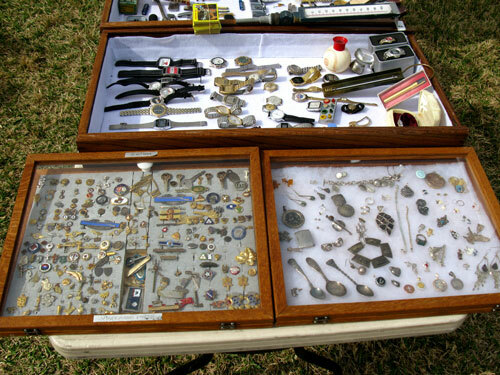 There were several tables, though, that had a hodge-podge of what looked like costume jewelery. I guess it sells real well. How women have the patience to look through it, though, is beyond me. 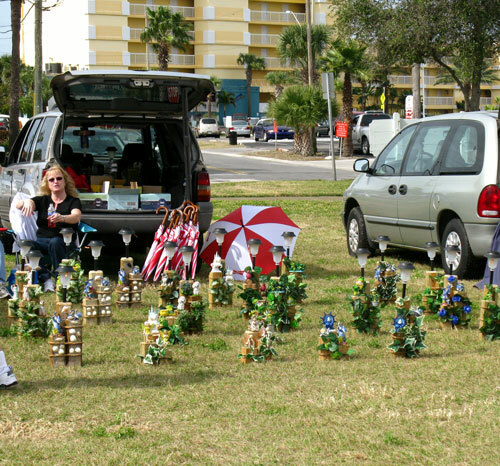 Another table was selling lawn ornaments. It looked like a great deal of time had been put into crafting them. The table selling memorabilia interested me, but there was always a crowd around the items and I couldn't get as good a look as I wanted. 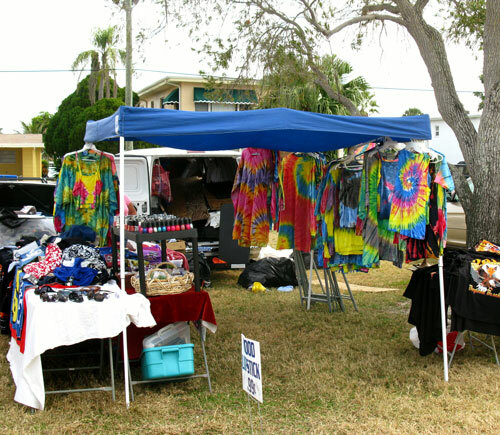 How could the Treasure Island Open Air Market be legit without selling colorful tie-dyed shirts, wrap-around sunglasses, and motorcycle/whiskey logo caps? I mean...this is where it all started, right? The produce stand was probably the biggest draw for us locals. 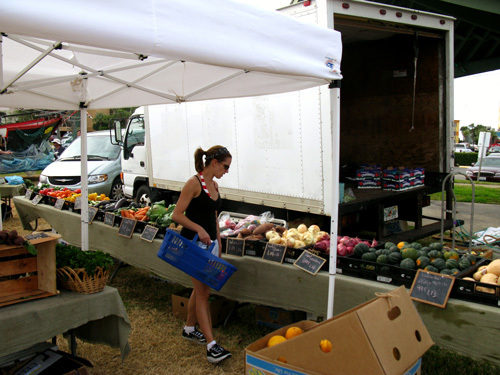 The prices were good and the fruits and vegetables looked beautiful. 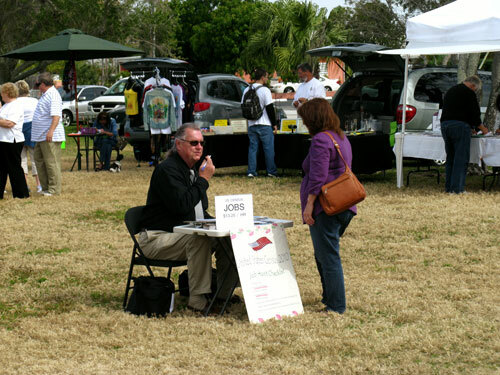 As I was leaving the Treasure Island Open Air Market, I noticed a small table offering Census Bureau jobs for $13.25 an hour. It was completely unexpected, but good insight on their part. He seemed to be getting some interest, also. I was glad I came. The day was cool and I got to talk to a lot of nice people. Most were visitors trying to immerse themselves in the Florida beach lifestyle, and seemed to be enjoying themselves while doing it.